Just a brief post for the first session. We were down Lydia, but the others wanted to start. This session saw a lot of interaction in the town of Goldenleaf, some world building (extended epilogue post Tyranny of Dragons) and some good ol' fashioned random drink table fun. 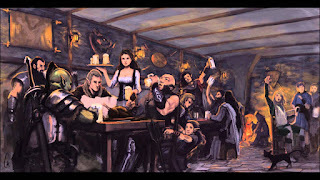 [Curse of Strahd Index][Next Episode] DM NotesThe party begins in Goldenleaf, with Driessa recruiting Caecillius and Anghar to work with her in the Order of Rorik, a group focused on doing good and helping rebuild after the destruction of the Cult of the Dragon. Okay! I'm going to try to keep up with this one since it's hot off the press! 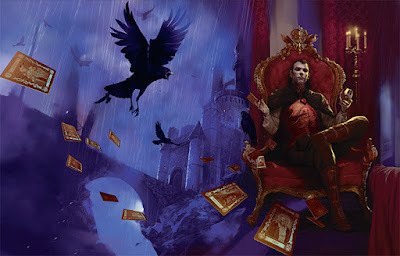 We have started a new campaign, and settled on the Curse of Strahd. Following this post, I will include our in character journals, and a link to our list of NPCs which is updated after each game. Without further ado, here are the character backgrounds for the current cast of characters. Mounted Combat is a paradigm I've struggled with from time to time here at Castle Mac. The PHB leaves a bit to be desired, and it can be confusing to understand the ins and outs of mounted combat. This became especially painful for me when we played Cubicle 7's Adventures in Middle Earth Lord of the Rings 5e supplement and I chose to play as a Rohirrim. Disclaimer: We at Castle Mac try to stay close to Rules as Written, including the rule that the DM has final say over any rules, even when they override the Rules As Written. 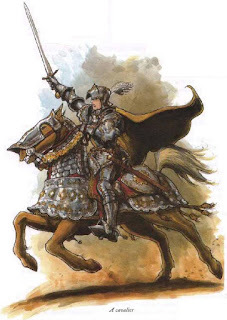 This post is an attempt to collect the printed Mounted Combat Rules, collect and parse Jeremy Crawford's Twitter responses (which are more about Rules as Intended), and introduce a few extrapolations of our own to make Mounted Combat more clearly defined. Some of what I observe below is probably quite obvious to most of you, but hopefully will help others!